As recession draws in, Carnival Cruise Lines withdraws from Europe and parent Carnival Corporation cuts 2009 dividends, Royal Caribbean expands but notes a significant deterioration in new bookings, Fred Olsen cuts its fly-cruising program from Miami, Windstar halves deposits and SeaDream allows cancellation for any reason. It's a good time to look at what the future might bear for the cruise industry. The Cruise Examiner surveys the peaks (and troughs) of the cruise industry to see what might lie ahead. First, let's look at early cruise line bankruptcies to see what happened. 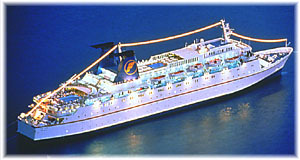 Regency Cruises, formed in 1984, disappeared in 1995 when its parent, the Lelakis Group of Greece, collapsed, taking the cruise line with it. Premier Cruise Line had been formed in 1983, a year earlier than Regency, and would survive a little longer, with particular success as the official cruise line for Disney World before Disney decided to open its own cruise line. Under new owners, Premier would finally have to file for bankruptcy in September 2000. In each case, the line had its own following but there was no ready buyer, probably because they both operated with a collection of second-hand tonnage. The two fleets were sold off in dribs and drabs, with only the best ships finding further employment and many, even if they had come from respectable careers, never sailing again. This seemed to prove that competing against new ships with second-hand tonnage was probably not a good idea. 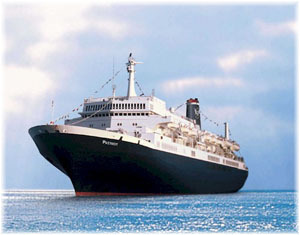 Between these two, in 1997, UK-based CTC Cruise Lines ceased trading, but mainly because, after years of successful operations, the dismantling of the former Soviet Union led to the Ukrainian owners of the ships it had chartered missing payments on fuel and port bills. Ironically, CTC's best ship, the Southern Cross, was one that was purchased from Premier and would go to Festival. Over-ambitious plans probably claimed the next two important cruise lines when American Classic Voyages and Renaissance Cruises went down in the aftermath of September 11. These lines had been so lightly financed that a brief stop in bookings caused by the terrorist attacks on New York and Washington brought them both down within just weeks, or even days, of the event. Renaissance closed on September 25, only two weeks after the attacks. This was a major loss, involving as it did eight very popular mid-sized cruise ships that had only recently been delivered. But it was not the first time Renaissance had ordered eight new ships for delivery in such a short period of time and they should have known better. The last great expansion, with eight smaller ships in a similar time frame in 1988-91, had caused the bankruptcy of renowned Norwegian shipping company Fearnley & Eger, a company that had been founded in 1869. American Classic went down on October 18 and was another major loss to the industry. 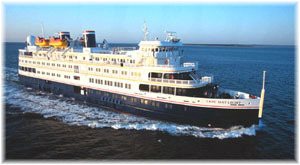 Not only did it involve two new ships that were being built for American Hawaii Cruises and a revived United States Lines operating the Patriot, but it also included the Delta Queen Steamboat Company and the affiliated Delta Queen Coastal Cruises, which had just taken delivery of the first of two coastal cruise ships. This expansion had been too much at once and American Classic was already running into huge cost over-runs on the new ships it was building for Hawaii when it all happened. That September 11 was not the real reason for either bankruptcy is proven by the fact that they were not alone in 2001. Ten-year-old expedition operator Marine Expeditions went down in June after the associated World Cruise Company lost $1 million a circumnavigation on a fuel price spike that occurred that year, resulting in the arrest of its ship in mid-voyage in Tahiti. Newcomer Great Lakes Cruises went down in July when a newly-chartered ship scored badly with the US Public Health Service. The "Detroit Free Press" ran the story on its front page and the resulting mass of cancellations caused the demise of the line. And Festive Cruises, a UK charterer and part of Festive Holidays, went under in November as part of a succession of lightly-financed tour operators that had included Four Winds Cruises before it and would include Travelscope after it, in 2007. In all five cases in 2001, the operators had not been strongly enough financed to be able to survive a problem. And so it may be today. As if to prove that September 11 was not the real cause of the American Classic and Renaissance bankruptcies, two more cruise lines would follow within not much more than a couple of years, their demise caused by a combination of over-expansion and inadequate financing. In late 2003/early 2004, it was the turn of two Greek operators. Festival Cruises under George Poulides had started off with one ship, The Azur, that at first had been chartered to Chandris Cruises, but then it struck out on its own with two more second-hand ships and eventually three newbuildings. It was the attempt at paying for these that eventually brought Festival Cruises under. The demise of Festival turned into a saga that dragged on for several months, almost like a chase for German raiders in South America, as various ships were arrested at different times and the line made new announcements, but finally it ended. Royal Olympic, meanwhile, had been successfully operating an extensive fleet of second-hand cruise ships, in the usual Greek way, when it decided it needed to build two super-fast cruise ships at Blohm & Voss, a decision it would come to regret. In Royal Olympic's case, it would be legal action over these two ships that would bring the cruise line down. In its case the demise was not as protracted as Festival's, but it did involve different ships being arrested in different places at different times, and finally Royal Olympic was gone too. In both these cases, the lines' marketing efforts in North America had been hamstrung by stupid disputes over trading names. Carnival had objected to the name Festival so that company had to call itself First European Cruises in the United States. And the US Olympic Committee managed legally to force Royal Olympic, a merger of the old Sun Line and Epirotiki Cruises, into calling itself Royal Olympia Cruises in the US. Such disputes did not help but were not key to their demise. Last month, closure announcements were made for three more cruise lines - Island Cruises, Ocean Village and Majestic America - two in the name of rationalization and the third simply because sellers could not find a buyer. Island Cruises is being closed because joint owners First Choice and Royal Caribbean have different ideas about how to pursue the UK market. First Choice is now part of the new UK-based TUI Travel, which of course owns Thomson Cruises, while Royal Caribbean are going for their share with UK-based Royal Caribbean and Celebrity ships. Neither feels any further need for Island Cruises. Ocean Village, meanwhile, will be closed down over two years as new ships deliver to P&O and Cunard. All three are Carnival UK companies. Gaining from this will be P&O Australia, which will gain two good ships from Ocean Village. Meanwhile, the Ocean Village brand will be closed in 2010, when the new Queen Elizabeth delivers to Cunard. Majestic America however is a partial re-run of American Classic. This time the Empress of the North has been repossessed by the US Maritime Administration, with the American Queen likely to follow, and five other Delta Queen and America West ships have been put up for sale individually. The next question is what Majestic America parent Ambassadors International might do with the very recently acquired Windstar Cruises. The lines were drawn last week for the big two, Carnival and Royal Caribbean. Carnival Cruise Lines announced that it was retrenching, withdrawing the Carnival Dream from Europe in favour of the Caribbean, and its parent Carnival Corpratrion will eliminate all dividends for 2009, something that should save it $1.5 billion in cash flow at a time when banks are not lending. Royal Caribbean, meanwhile, stated that it had on hand liquidity of $1.4 billion and that it was pursuing its expansionist policy with delivery of Oasis of the Seas next November and expansion into the German market with TUI Cruises. To date, it has said that it is not likely to order more tonnage soon although some have called on them to say they would not. Both lines acknowledge a drop in future bookings and are preparing for a storm. Of any, these two are the best positioned to last it out. The silver lining in the black cloiuds meanwhile is that the cost of fuel has dropped again and quite substantially. While Carnival and Royal Caribbean conduct their industry phone calls the next two, MSC Cruises and Norwegian Cruise Line, continue to attract speculation. MSC has been on a cruise ship ordering binge and from five ships in 2004 it will soon have thirteen ships. NCL meanwhile, is in a well-known dispute about whether its newest ships will even be built. The big question about MSC is not only how it will be able to survive such a rapid expansion in such a short number of years, but how its parent company, Mediterranean Shipping Company, the world's second largest container line, can cope in a diminishing market where freight rates are dropping every week. NCL may be in a bit of a stronger position, now being half-owned by Apollo Management as well as Star Cruises. But Apollo had had to follow through on a recent major acquisition in another market and has a full interest in Oceanis Cruises and Regent Seven Seas Cruises that it must also look after. There have also been reported disagreements between Apollo and NCL as to the future path that NCL should be taking, one of the reasons for the dispute over the F3s. Will there be anyone interested in making a bid for either? Can the two get together to take on the big two? They have no appreciable overlap after all. 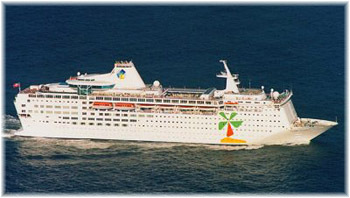 Or would MSC fill a hole that Royal Caribbean has and offer a counterpoint to Carnival's Costa? Could Royal Caribbean afford it if it came to that, or might MSC join other shipowners from Norway and Israel as shareholders in Royal Caribbean?